Arkansas has some of the best fall foliage because much of the state is covered in natural forests. Driving anywhere, even in Central Arkansas, during the fall brings nearly endless views of richly-colored trees as far as you can see. According to the foliage season guide, the leaves start changing colors in October in northern Arkansas and continue to change through mid-November while the southern part of the state doesn't typically experience the changing foliage until early-to-late November. As a result, the part of the state you'll want to visit will largely depend on when you plan your trip. Scenic Byway 7 goes through four of the state's geographic regions: the Western Gulf Coastal Plain, the Ouachita Mountains, the Ozark Mountains, and the Ozark National Forest. It contains 290 miles of road, and there are several "can't miss" spots if you're looking for fall color along the way. The section of the road that goes through the Ozark Mountains and heads into Jasper on its way to Harrison are some of the best places to see fall foliage in the state. 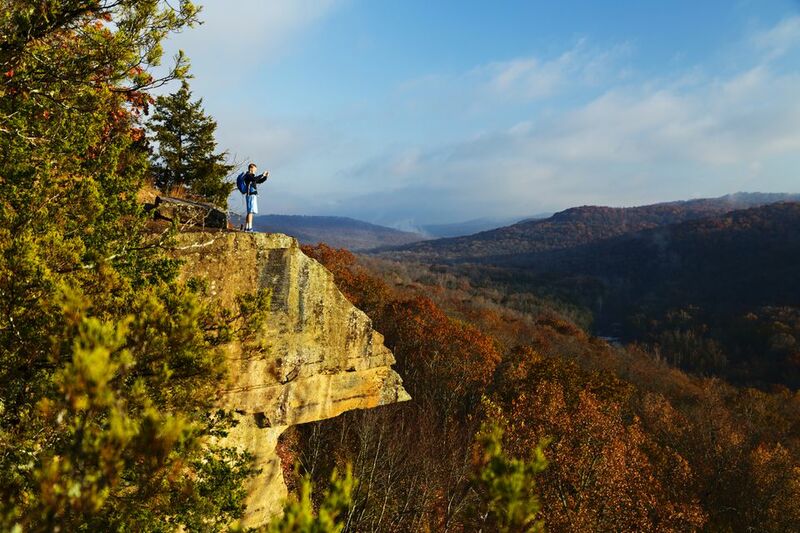 In this region, you have the Buffalo National River and the Grand Canyon of the Ozarks, both of which offer beautiful drives and plenty of opportunities to get out of your car and walk around in the forest. Speaking of state parks, if you are looking to drive and hike, Petit Jean is a great state park for fall color. Mount Magazine is close enough that you should add it to your trip so you can see some of the stunning vistas from the highest peak in Arkansas. Both of the mountains have some great hikes, but also some nice views from the road and turnouts, so you don't have to hike if you don't want to. This 42-mile loop follows a former stagecoach route along U.S. 71 and Interstate 540 through the Boston mountain range of the Ozarks and offers some great scenic vistas where you can pull off and view the scenery. The loop goes through Fayetteville, Fort Smith Forest, and Devil's Den State Park, and you'll also drive through Arkansas wine country along the way. The best time to see fall foliage along the Boston Mountains Scenic Loop is in mid-October, and the leaves typically start to change colors toward the beginning of the month. This is especially true for black gum trees, which turn a bright red earlier in the season than other species in the area. When you mention Blanchard Springs, most people think of the caverns in Ozark National Forest, but the foliage there is just as big of a draw come autumn each year. The springs themselves and mirror lake make for a nice backdrop for the colors, and Mountain View is a great town to visit for the most of fall colors. Located in the Ozarks of northern Arkansas, the best time to visit Blanchard Springs is in late October, when the foliage is at its most vibrant. The St. Francis Scenic Byway is located between the cities of Mariana and Helena, Arkansas. This scenic byway travels along the crest of Crowley’s Ridge for over 21 miles and is designated as the Great River Road. Approximately 14 miles of this road is gravel, so beware of that when planning your trip. Even though the gravel roads aren't particularly hard to drive on, you may want to travel slowly to avoid sliding on loose gravel. If you can stand that, the two lakes and plentiful forest make for some great views. The best time to drive along the Great River Road is in early to mid-November when the foliage has the most to offer. The Talimena National Scenic Byway (state route 88) is a shorter drive (54 miles) that begins in Mena and goes through some beautiful countryside, including Queen Wilhelmina State Park, which sits at the top of Rich Mountain and is also known as the castle in the clouds. This region has many turnouts and interpretive signs about Arkansas history, and the scenic byway goes all the way to Oklahoma. However, you can also turn around in Queen Wilhelmina State Park and still get some great foliage views. If you want the scenic without the drive, you can get a ticket on the Arkansas and Missouri Railroad. Passenger trains depart from the Van Buren and Springdale stations during fall, and there are a variety of day trips and short journeys you can take throughout the season. It's a nice way to see the colors without the drive, and riding on the train is a unique family experience.